The Teenage Mutant Ninja Turtles (TMNT or Ninja Turtles) are a team of four anthropomorphic turtles, who are trained by their sensei, Master Splinter, to become skilled ninja warriors. From their home in the sewers of Manhattan, the Teenage Mutant Ninja Turtles battle petty criminals, evil megalomaniacs, and alien invaders, all while remaining isolated from society at large. The TMNT originated in an American comic book published by Mirage Studios in 1984. 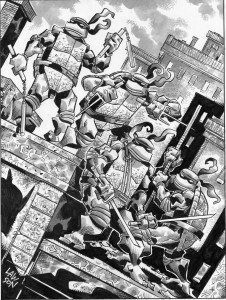 The concept arose from a comical sketch by Kevin Eastman during a casual evening of brainstorming with his friend Peter Laird. Using money from a tax refund together with a loan from Eastman’s uncle, the young artists self-published a single-issue comic intended to parody four of the most popular comics of the early 1980s: Marvel Comics’ X-Men/The New Mutants, which featured teenage mutants, Daredevil, which featured ninja clans dueling for control of the New York City underworld, and also comics Cerebus and Ronin. What started as a parody comic book launched the Teenage Mutant Ninja Turtles into a world wide marketing phenomenon. Leonardo, Michelangelo, Raphael, and Donatello were found everywhere; children’s television shows, comics, toys, magazines, and more. Compiling and archiving information on the Teenage Mutant Ninja Turtles is a heavy task, one that this website intends of taking on. Featured on this website you will find a wealth of information about the Teenage Mutant Ninja Turtles. Learn about the beginnings TMNT had in comics, magazines, and newspapers with pictures and covers of each comic as well as a short summary of the issue. Their debut in television and film as well as being featured in the game industry with information ranging from cartoon episode lists, casts and crew, to game designers. Pictures of all of the various merchandise which includes any and everything Teenage Mutant Ninja Turtles related that is or has been on the market at some point in time. This includes toys, clothes, food items, home media (DVDs, CDs, etc) and more! MutantOoze.org also features Mutant and Human biographies. Take some time to learn about the artists, writers, colorists, inkers, voice actors, film actors, producers, and countless others who have worked on TMNT in the past, present, and foreseeable future. Along with humans there are biographies for each of the characters found in the Ninja Turtle multi-verse. The history of the Teenage Mutant Ninja Turtles is filled with lots of information. Be sure to check out the various sections of this website to see the entire scope of this property. Many pages are linked to other pages, so feel free to explore and get an in depth look at the Teenage Mutant Ninja Turtles. New items are being added all of the time as well as items that have already been on the site receiving updates with new information, pictures, and more. Stay up to date on the events including conventions and other appearances and also the latest comic releases from IDW. Keep connected to follow news and information about the newest Nickelodeon Teenage Mutant Ninja Turtles series, as well as the newest toys coming out! Stay up to date with what is going with this website as well as what’s happening in the TMNT world by clicking on the News Feed on the left side of the page. Also be sure to check out MutantOoze.org favorites Roseangelo’s NinjaPizza.net and Stephan and Crew’s GoGreenMachine.org for more Teenage Mutant Ninja Turtles news and content. And for those that want to collaborate and talk turtle with fellow TMNT fans head on over to Shredder and Krang’s TMNT fansite The Technodrome, the largest TMNT forum on the net. For other Teenage Mutant Ninja Turtle goodies head on over to TeenageMutantNinjaTurtles.com as well as our links page where we have compiled a huge list of links to Teenage Mutant Ninja Turtles sites all over the net. If you find a dead link please be sure to let us know so we can update the list. I would like to extend a very special thank you to all of the TMNT fans out there who have helped submit material for this database or have allowed me to copy information they have already written/compiled. MutantOoze.org would also like to thank the original NinjaTurtles.com web team for keeping their site filled with Teenage Mutant Ninja Turtle history. Unfortunately that site is now gone which is what prompted the build of this massive database. You can view the original NinjaTurtles.com website by clicking here. Very big thank you to tOkKa from Terrible2z.com, Vaughn Michael from VaughnMichael.blogspot.com, Rich from TMNT-NinjaTurtles.com, and Mark Pellegrini from TMNT Entity for providing images and summaries for several areas of this website. Also special thanks to the contributors of TMNTPedia which is where lots of the biographical information comes from. Join the TMNT Fan Club! If you have any questions, comments, corrections, or you would like to help contribute to this wiki, please send an email to submit@mutantooze.org. MutantOoze.org is always looking for contributors or fact checkers! Subscribe to our RSS feed or connect with us on Twitter, Facebook, Google+ or Tumblr for notifications of new additions to the site. Feel free to tweet or share articles you find interesting. Content on this site has been collected and compiled as a way to archive all of the information about TMNT. As with Wikipedia and TMNTPedia, the content of this site is available under the GNU Free Documentation License. If you would like something that you own removed from MutantOoze.org please send an email to submit@mutantooze.org. There are no downloads for Teenage Mutant Ninja Turtles digital comics, movies, t.v. shows, or any other illegal content. If you see something you like, buy it. Check out the Shop for links to various Teenage Mutant Ninja Turtles related items, including DVDs, T-Shirts, and more! We are not responsible for items that may no longer be available or for the purchases you decide to make. Funding received from any affiliates, advertisers, or any other entity is solely for keeping this site running. Content creators, if you see something that you have created but feel you have not been credited properly please contact MutantOoze.org.